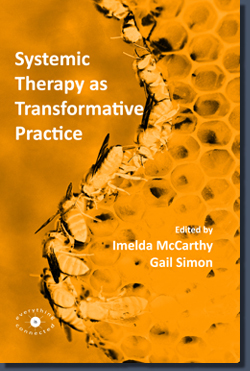 Systemic Therapy as Transformative Practice is a collection of writings on innovative, contemporary practice from leading edge therapists around the world. The book showcases ground-breaking systemic practice from Greece, Italy, Netherlands, Ireland, England, Canada, Sweden and USA. The writings address connections between change in smaller and wider systems, connecting local with global – all against a backdrop of massive economic and social instability worldwide. The writers share stories from their everyday working lives with creative reflections on the intersections of systemic, social constructionist, narrative, dialogical, appreciative, constructivist and collaborative theories. "This book is a landmark in the field of systemic theory and practice. It brings together contributions from leading European and North American practitioners and academics on a wide range of topics relevant to systemic practice, couple and family therapy. The book shows how practices based on systems theory and social constructionism can transform lives in a world recovering from an economic and social crisis. Scholarly, but also immensely practical and a ‘must-read’ for all family therapists." "This timely book illuminates the crucial contribution of systemic ideas to creative therapy, organisational work, training and research and it is particularly welcome at a time when we face increasing inequalities and constraints on our freedoms. Systemic thinking has always had the capacity to be revolutionary and I am confident this book will inspire with its range of creative and emancipatory ideas and practices." "The transformative qualities of systemic therapy to matters of human distress are abundantly displayed in this fresh exposition systemic therapy and its refined application. The humanity of each author shines through in their ability to combine rigorous thinking with imaginative co-creative practice." "In an increasing neo-liberal word where the emphasis is on individualistic models of practice and economic discourses of human support, this volume offers an impressive collection of European and North American systemic practitioners that critically, creatively and competently show how systemic ideas are transformative. An invaluable resource for students, scholars and practitioners!" "The ecological view, the Batesonian legacy to the field, aligned with the politics and philosophy of subjective experience is the common thread connecting the chapters. Grassroots activism as a sister movement gives energy and conviction to the practices described, where communities are honoured in their need, resilience and entitlement."